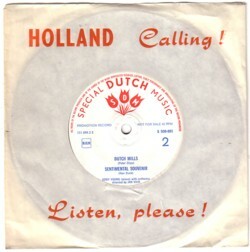 On April 10 I wrote about the Holland Music NV. I realise that this was probably one of the least interesting stories in this Soundtrack so far, but that knowledge could not stop me from writing an update. 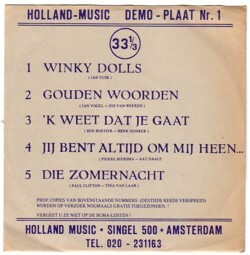 I knew I had more records of Holland Music NV than the four that I mentioned. And last night I found them. One is another demonstration record (volume 1), but two are real 45’s, probably made for international promotion. That may sound a bit more interesting than what I could tell you on April 10, but I am afraid it is not. On one 45 are four instrumental compositions in the very easy listening genre. Think of velvet brass and candlelight pianos and you know why I am not going to share that with you. The other single (is this a word used in English, single ? It sounds so Dutch…) has one instrumental ode to our tulips and street organs and one vocal song about Amsterdam, sung by Jany Bron. I vaguely remember the song, so I might have been a hit. 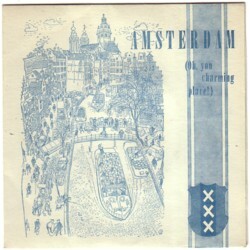 But it could just as well be that it reminds me of all the similar songs about Amsterdam, of which there are enough to drive you crazy.